Dr. Yaremchuk has designed intraorbital rim implants to treat patients with deficient midfaces and resultant prominent eyes. These implants can have a powerful effect on improving the appearance of the eyes, especially for patients with prominent eyes, and can be an important adjunct in lower lid rejuvenation. In most people, the relationship between the ocular globes (eyes) and the cheek tissues is such that on lateral view, the cheek projects beyond the eye. This relationship, due primarily to the shape of the facial bones beneath the cheek tissues, has been termed a 'positive vector'. When the midfacial bones are less fully developed, the eye projects beyond the cheek and, as a result, the eyes look prominent. This relationship has been termed a 'negative vector'. Patients with negative vector skeletal morphology have less support for their cheek and lower eyelids. With aging, gravity causes their cheek and lower lid to descend prematurely, compared to patients with more prominent midfacial skeletons. Furthermore, these patients are predisposed to having further lower lid descent with scleral show, round eyes (and 'dry eyes') after conventional lower blepharoplasty. Illustrations by Kip Carter, MS CMI. Dr. Yaremchuk has designed an implant to correct this problem. Implant augmentation of the infraorbital rim (the bone behind the lower eyelid) increases the projection of this area "reversing the negative vector" (this is different than a cheek implant). By improving the underlying skeletal support with an infraorbital rim implant, lifting the midface soft tissues, and tightening the lateral corner of the eye (lateral cantopexy), the ''round eye' appearance of patient with midface hypoplasia (negative vector) – can be corrected. 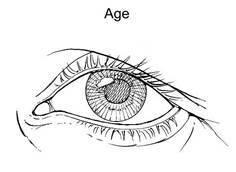 Infraorbital rim implants can reverse the effects of aging on the eye by recreating a more youthful eye shape. The upper and lower lids frame the eye. This frame is called the palpebral fissure. 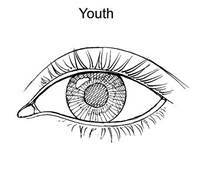 The shape of the palpebral fissure in young, attractive adults is long and narrow. The aging process causes loss of elasticity in soft tissues and deterioration of the facial skeleton. These factors together with gravity result in a change of shape of the palpebral fissure. With descent of the lower lid, the palpebral fissure becomes round. Recent data by Kahn and by Pessa support the concept that the aging process not only causes soft tissue atrophy leading to volume depletion in the periorbital and midface area, but also a loss of projection of the midface skeleton. This diminution in projection would hasten the gravitational-induced descent of their overlying and now, less supported, soft tissue envelope. This is true in both convex and, particularly, concave faces. Infraorbital rim implants address the areas of skeletal change found in these studies. Augmentation of the infraorbital rim and resuspension of the cheek soft tissues can have a rejuvenating effect in properly selected patients. These three-dimensional reconstructions of typical youthful and aged orbits were provided by Dr. David Kahn. Note how the infraorbital rim implant placed on the aged skeleton (far right) transforms the contour of the aged orbit (middle image) to resemble the contour of the youthful orbit (far left). * This patient had a previous blepharoplasty. She was displeased with the amount of white showing between her iris and lower lid as well as the downward tilt of the corner of her eyes. She was predisposed to having this problem because of the lack of bone support beneath her eye. Dr. Yaremchuk improved here eye shape and upper facial contour with-a midface lift, augmentation of the infraorbital rim with a porous implant and lateral canthopexy. * This patient was displeased with a "round eye" appearance and symptoms of dryness after lower eyelid surgery. The dropping of his lower lid was due to excessive removal of eyelid tissue during his surgery, and to a deficiency of bone support behind his lower lid. Dr. Yaremchuk restored his eye shape and improved his facial contour by elevating his lower lid and tightening it with a midface lift and lateral canthopexy, respectively. Dr. Yaremchuk provided support to the lower lid and improved the patient's cheek contour by placing an infraorbital rim implant on the bone behind the lower eyelid. * This patient had undergone multiple procedures to correct lower lid malposition after previous bleparoplasty. These previous operations included multiple canthopexies and skin grafts. The patient was also displeased with the appearance of her brow and upper lids after upper lid blepharoplasty and endoscopic brow lift. The previous attempts at lower lid repositioning was, in large part, due to the inadequate skeletal support provided by her retrusive midface skeleton. Dr. Yaremchuk provided skeletal support with an infraorbital rim implant, then elevated the midface with a subperiosteal midface lift, and repositioned the lateral canthus with a lateral canthopexy. He further improved the periorbital appearance by repositioning the over elevated brows. * This patient underwent infraorbital rim augmentation and subperiosteal midface lift to improve his periorbital appearance. He had not had any previous surgery. * This patient underwent infraorbital rim augmentation and subperiosteal midface lift to improve her periorbital appearance.